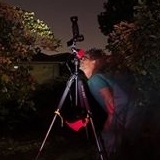 Tonight was clear despite the bad forecast so I gave my setup a try. Was using a quite recent nightly build of Windows client. Two CCD cameras. Let me start with the problem first. -- Live View doesn't work for ZWO ASI1600MC when in 16bit mode. Getting white frames with some noise. Preview (16bit) works fine. Live View in 8bit works fine. -- Polar Alignment now works (it wouldn't refresh images before). Now it refreshes but stopps refreshing after about 3 min saying that it was done with the procedure (I didn't double check this one). (Oh, great! KStars just crashed! I was shooting the Owl Nebula at the moment. It was running for about 4 hours. I did many different things with it. Just crashed while I was writing this post (same PC)). Last edit: 2 months 1 week ago by maxthebuilder. White frames mean that the pixel values are all zero. What gain were you using with the Live View? I usually set the gain to 800 or so when using the Live View. When I start imaging I set it back to 139 and offset to 21 (unity gain). I didn't go as high as 800 but tried 560. Again, it works at 8bit.